The Ada Initiative has announced its new executive director is Crystal Huff. The Ada Initiative supports women in open technology and culture through activities such as producing codes of conduct and anti-harassment policies, advocating for gender diversity, teaching ally skills, and hosting conferences for women in open tech/culture. 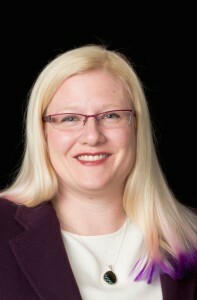 Huff brings to the organization her experience in the software industry as the Chief Coherence Officer of Luminoso, a Boston-area startup, and her conrunning experience as a director and past chair of Readercon, and past chair and officer of Arisia. The Ada Initiative is a non-profit organization currently employing three staff and half a dozen contractors. This entry was posted in Heard Online and tagged Ada Initiative, Crystal Huff by Mike Glyer. Bookmark the permalink. Woo hoo! Good for Crystal! But … “Chief Coherence Officer”?? What does that even mean? I’ve spent many years in software, and I’ve never seen that title.